We know, that breaking the cycle of stress, anxiety and migraine is not easy if you get frequent attacks. Just follow the steps below to manage your migraine pains temporarily and consult our specialist for a complete cure of Migraine. The anticipation of another attack can be stressful, especially when some of the warning symptoms (yawning, neck pain and more) begin. Stress is commonly regarded as a migraine trigger. If you can keep calm during an attack, you just might be able to make your pain less severe. Stress can be a deceptive trigger. When you’re really stressed, you may get a migraine and assume that stress was the trigger to blame. Sometimes it is, sometimes it isn’t the only trigger at play. If you’ve ever lost sleep, skipped a meal, tightened your muscles, clenched your teeth or even cried, those triggers could also be contributing to your migraine. All of these behaviours and symptoms can occur when you’re stressed. Because triggers are additive, it’s often hard to discern what’s really triggering your attack. Maybe it’s ALL the ways your body reacts to stress that’s the problem. Try to tune into what’s happening, and consider these preventative ways to retrain your brain and body to react differently. Remember, you are strong enough to endure another migraine, even if nothing seems to bring relief. You have survived migraines before and you can make it through this one. Try to stay calm and stop fighting what your body is demanding. Let it go. Breathing exercises may help. Patience is a requirement when coping with a chronic illness but it is definitely not easy to be patient when you are suffering and in pain. It takes time to accept that this is part of your life and learn to manage it. Accepting that perfection is not possible and embracing your life with a migraine takes time. Walking away from school, work, plans and other obligations is difficult for planners. We feel that we are letting others down and also missing out on yet another thing. No one wants to cancel plans, but when Migraine forces us to do so at the last minute, it’s hard to keep calm. Here’s a better way to make plans. Migraine brains crave consistency. Although it is hard to be regimented due to the unpredictable nature of our migraines, it’s essential. Stick to a consistent sleep, diet, exercise, hydration, and medication routine. First, try to regulate your sleep. It’s challenging because of medications and fatigue but it is helpful if your body has a “clock.” Next, make sure to keep water with you always, staying well hydrated — especially when you’re demanding more of your body or on hot days! Keep meals regular – do not skip, since this is a common migraine trigger. Pack a snack wherever you go. Set alarms to make sure you don’t miss your medications. Finally, get some form of exercise every day that you’re able. Even a 10-minute walk or yoga is helpful. When I follow a consistent schedule, my migraines are less frequent and intense. Don’t panic if life gets hectic and your routine gets disrupted. That’s life. Do your best and don’t punish yourself if you miss something. You don’t receive extra credit for needless suffering, you do enough suffering to last a lifetime. Sounds like an oxymoron – which may be why so many of us suffer from attacks on the weekends. Try to relax, in whatever way work best for you. Make a date with yourself and plan it. Sing and dance, write, create, do yoga, workout, walk, play with your fur baby, get out with your loved ones, enjoy nature, get dressed up and feel pretty, cook…whatever floats YOUR boat. Let yourself enjoy your pain-free or low pain days to the best of your ability. Don’t give a second thought about the judgment of others. Those that truly love and support you will be happy to see you enjoying your good days. Sometimes you have to look at the bigger picture. Yes, Chronic Migraine is a disability. However, having the brain of a migraine sufferer is both a curse and a blessing. A migraine sufferer’s brain is unique. We see the world in a rare way and have incredibly heightened senses, which leads to rare talents. Explore those unique talents. In many ways, a migraine can be limiting, but if you learn to play to your strengths your migraine disability can become your ability. I truly believe everyone has a purpose, and everything in life happens for a reason. So ask yourself, why me? Why are migraines a part of my life journey? Learn to embrace this difficult time in your life. Because even this pain will be useful to you one day. 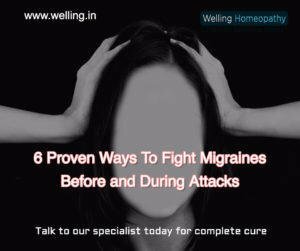 If you need more help to stay calm and consistent, talk to our specialist or get started with your specially formulated Homeopathy treatment for the complete cure of Migraine.